We are planning on running two yurt building courses in 2017/18 to celebrate 20 years of yurt living and making. There will be an intensive 8 day course in June and another spread over 5 months starting in the autumn. Please send us an email if you are interested in further details. Yurtworks is one of the longest running yurt making businesses in the UK and our courses are one of few run by a professional yurt maker. We have been making yurts for 20 years and have visited yurt makers in the Kyrgyz Republic in 1999 and Mongolia in 2004 and 2005 . 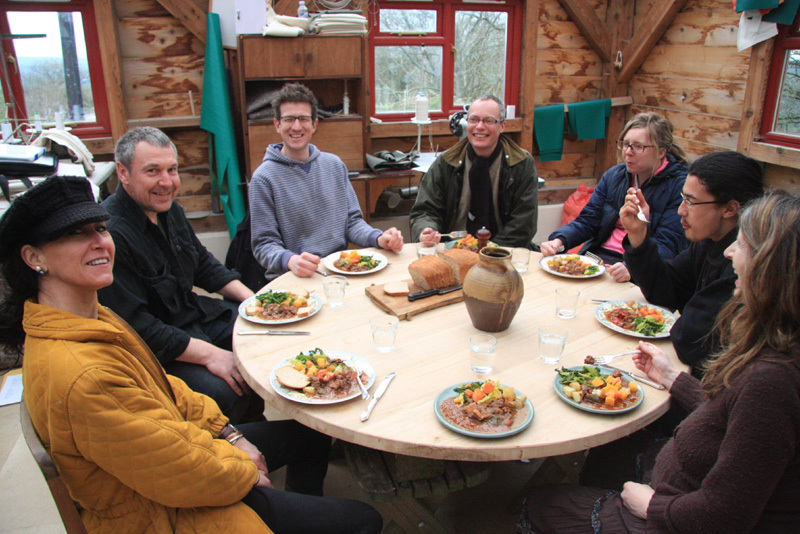 The aim of this course is to enable everyone to make their own yurt over the 5 month period. Places are limited to six so that participants have the space and support they need to complete the project. ( See below for more details). The workshop facilities are usually available to use on Friday afternoons before a weekend session between 1-5pm and on the saturday evenings until 10pm when the course is running. On this course everyone works towards building one yurt frame following an authentic central asian design. The wheel (tono)will be cleft and hewn from a single tree, the wood will be from coppiced and cleft poles. There will also be oportunities to make felt, use rawhide bindings and look at natural cordage in the context of the yurt makers craft. The aim of this course is to cover all the skills of the extensive course ( see below for more details),plus a few extra so that you can build your own at home. It will also go into traditional yurt design and techniques in more detail but you will not be making your own yurt during the course. You will learn about the different materials available for liners ,insulation, and outer layers, how to make a pattern for any size of yurt. How to do a final fitting as well as how to sew the various seams and finishes involved in making a full yurt cover. You will not be able to make your own cover over the weekend but will leave with the pattern and specs needed in order to make your own. This course is only available if you have done one of the Yurt frame making course at Yurtworks. The aim is for everyone to learn the skills and have the support to make their own yurt.The yurts made will be as individual as each maker but will all be of the highest quality possible. Building a yurt from tree to frame is a wonderfully empowering experience and although it requires no previous woodworking experience, the sense of achievement is immense.We make sure that everyone gets the support they need to make each stage through the build an enjoyable and rewarding process. There is email support throughout the duration of the course outside the supervised sessions. It is a very practical, hands on course which is why, with only a small group, we ensure that everyone gets a high level of personal and professional instruction. We only use coppiced wood and hand tools on the course so there will be the minimum of power tool use, this makes for a better atmosphere in the workshop and shows how few tools you need to make a yurt. Some people are able to source their own materials, for others this is more difficult. If you can source your own it becomes an even more satisfying process but we can supply some if not all materials if this is a problem**. Yurt history, different styles and design, know your gers from your yurts. Wood steaming and wheel making, including branding, spoking, binding, wedging and oiling. Shaping and steaming the roof poles. Unless you have alot of spare time and a ready supply of suitable wood it is wise not to be too ambitious with your first yurt which is why we recommend that you don't make anything bigger than a 12 or 14fter. If you have any queries about this give me ring or email beforehand. Slides of Kyrgyz and Mongolia yurtmakers. Accomodation: Camping, shared yurt, caravan or local B and B. Location: Yurtworks, St. Breward, Cornwall , PL304LP. The workshop is situated on the edge of Bodmin Moor with views across North Cornwall towards the sea. Cost: £180 per person per weekend on the Yurt Building course, includes homemade lunch, refreshments and evening meal on the saturday. Discounts of 10% available for two people working on one yurt. Material costs are additional (est. £300 ex covers for wood and cord). To secure your place a 50% advance payment is payable, with the balance payable one month before the course starts. *It will take longer than ten days to build your yurt.It's best seen as a winter project rather than something that you achieve in ten days. You will need to have time at home to do some work on it between sessions. The course aims to give you the skills, confidence and know how to complete what you cannot do during the supervised sessions. ** This will depend on the demand and the size of yurt.